Tym’s is DOT approved to hydrostatically test most kinds of cylinder assemblies. Testing is also available for foreign, experimental, and engineering sample compressed gas containers. The Department of Transportation (DOT) requires all cylinders to be hydrostatically tested every 3, 5, or 10 years. The time allowed by law is determined by a variety of factors such as the type of material, the gas it contains, its age, and special permits the cylinder may have been manufactured under. A “hydro test” is an approved way to test the structural integrity of a compressed gas container. It is performed by removing the valve, filling the container with water, and then pressuring the container above its operating limit. The expansion of the cylinder is measured, recorded, and analyzed. If cylinder expands beyond certain limits, the cylinder must be condemned. In most cases corrosion or other damage, internal or external, will render a cylinder useless before a failed hydrostatic test. How often is a hydro test required? This depends on the rating of the cylinder and the date it was last tested. The month and year of each hydro test is stamped onto the cylinder between a letter and four numbers identifying the tester. It is 3, 5, or 10 years from this date that the next hydro test is due. DOT 3AA with a “star” following the last hydro test date. Some cylinders have a 5-point star stamped into the cylinder after the last hydro test date making them eligible for a 10-year test under certain circumstances. These are specialty cylinders that fall within a range of testing requirements and are manufactured and tested with “special permits” from the DOT. DOT 3 3000 psig 5. DOT 3A, 3AA 5/3 times service pressure, except noncorrosive service ( see § 180.209(g) ) 5, 10, or 12 ( see § 180.209(b) , (e), (f), (h), and (j). DOT 3AL 5/3 times service pressure 5, 10 or 12 ( see § 180.209(e) , (j) and § 180.209(m) 3). DOT 3AX, 3AAX 5/3 times service pressure 5, 10 ( see § 180.209(e) . 3B, 3BN 2 times service pressure ( see § 180.209(g) ) 5 or 10 ( see § 180.209(e) , (f)). 3HT 5/3 times service pressure 3 ( see §§ 180.209(k) and 180.213(c)). 3T 5/3 times service pressure 5. 4AA480 2 times service pressure ( see § 180.209(g) ) 5 or 10 ( see § 180.209(e) or (h)). 4B, 4BA, 4BW, 4B-240ET 2 times service pressure, except non-corrosive service ( see § 180.209(g) ) 5, 10, or 12 ( see § 180.209(e) , (f), and (j)). 4D, 4DA, 4DS 2 times service 5. DOT 4E 2 times service pressure, except non-corrosive ( see § 180.209(g) ) 5 or 10 ( see § 180.209(e) ). 8, 8AL 10 or 20 ( see § 180.209(i) ). Exemption or special permit cylinder See current exemption or special permit See current exemption or special permit. Foreign cylinder ( see § 173.301(j) of this subchapter for restrictions on use) As marked on cylinder, but not less than 5/3 of any service or working pressure marking 5 ( see §§ 180.209(l) and 180.213(d)(2)). 1 Any cylinder not exceeding 2 inches outside diameter and less than 2 feet in length is excepted from volumetric expansion test. 2 For cylinders not marked with a service pressure, see § 173.301a(b) of this subchapter. 3 This provision does not apply to cylinders used for carbon dioxide, fire extinguisher or other industrial gas service. Other companies do not mention hydro tests, or don’t charge for them, what’s the story? The laws universally apply for all compressed gas containers. Many companies apply the cost of hydro testing to everyone, especially when tanks are exchanged. Tym’s does not charge everyone for hydro testing service. If your tank does not require hydro testing, you don’t pay for it! Unfortunately, some companies break the law and fill out-dated cylinders. What happens if the cylinder fails? In the unlikely circumstance that the cylinder fails the hydro test, a test report will be given to the customer and the cylinder must be destroyed. Hydrostatic testing is the most widespread way to inspect a compressed gas container for leaks or defects. 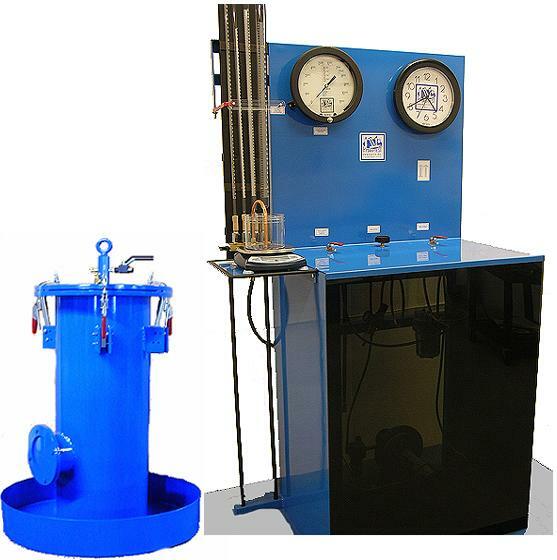 The cylinder undergoes hydrostatic testing with the purpose of checking whether it can safely hold its rated pressure. 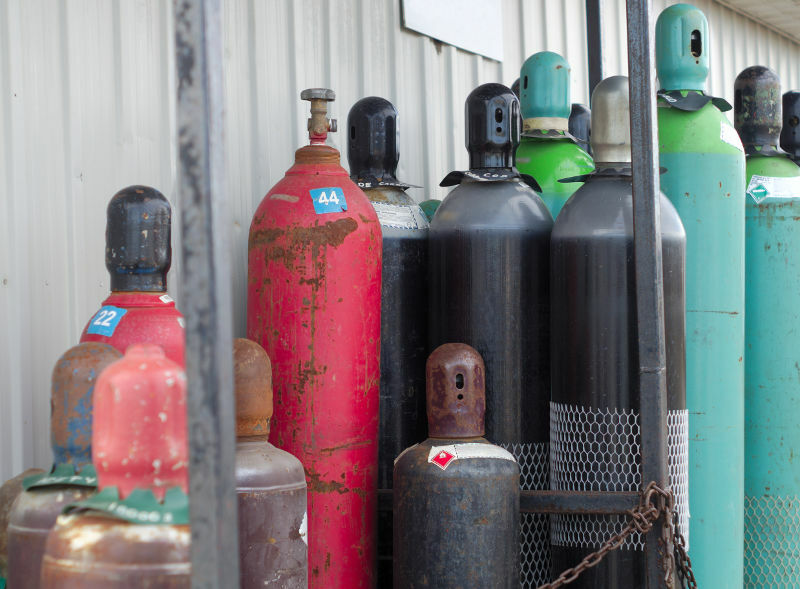 Hydrostatic testing is critical when it comes to compressed gas containers because they can explode in case if they fail when containing compressed gas. A hydrostatic test includes filling the container with a practically incompressible liquid (water) and examining it for leaks or changes in shape. The test pressure is considerably higher than the operating pressure to ensure safety. Usually 150% of the operating pressure is applied. Water is used in hydrostatic testing as it is almost incompressible and will only expand by a very small amount. In case of high-pressure gas use, it could exceed its compressed volume, posing a great risk of explosion. All compressed gas containers need regular hydrostatic testing. The frequency of the maintenance depends on the cylinder material. The Department of Transportation (DOT) recommends visual inspections to be performed on a regular basis as well. The DOT demands that hydrostatic retesting and re-qualification would be handled by registered specialists who have been certified by the DOT. At Tym’s Inc. all the necessary qualifications for hydrostatic testing are met, so you can trust our company for examining your compressed gas cylinders. Many other companies charge everyone for hydro testing, especially when tanks are exchanged. Tym’s Inc. does not do that, if your tank does not require hydrostatic testing, you don’t pay for it! The object of the pressure tank testing is to check if there is a significant drop of pressure which usually signals of a crack or hole in the tank. Pressure accumulation is a potentially dangerous situation, that’s why this kind of testingshould be conducted by a plumbing professional. Contact Tym’s Inc. and we will conduct both types of testing for you!